Forty years ago, female teachers hid their pregnancies to keep their jobs. They made lower wages than their male counterparts. Discrimination and gender disparities were the reality for Karen White’s mother, Nancy, a teacher in Fraser. Nancy White eventually became a union president and UniServ director in Local 1, fighting alongside others to secure school employees’ right to organize and bargain collectively – eventually establishing salary schedules, family leave policies, grievance procedures, and more. And Karen White is now the NEA’s first female deputy executive director in Washington, D.C. The Michigan native and MSU alumna returned to her roots to serve as keynote speaker at the annual Ladies Day at MEA last Friday. In a special pre-Mother’s Day treat, White’s mother attended the speech. White credits her mother’s generation for winning the opportunities, rights, and freedoms that everyone enjoys today. But those advancements are under threat, she warned, and it’s up to individuals to again step forward with courage to fight. “I learned from my mother that to succeed you have to work hard, you need to be loud, and you never give up,” White told the crowd gathered at MEA headquarters for the event. Attendees at Ladies Day enjoyed financial tips and personal safety training during the day-long event, highlighted by White’s speech which was followed by a lengthy question-and-answer session. White has worked as an educator, grassroots organizer, and national political director. She urged the MEA members and leaders in attendance to talk one-on-one with members and potential members alike with a message about what we can accomplish if we stick together. Privatization forces want to de-professionalize education and lower pay and benefits for school employees to increase profits at the expense of students. 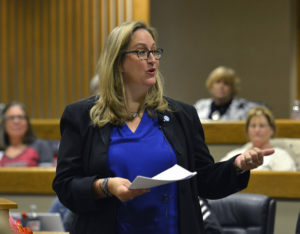 With that long game in mind it’s important for members to get involved in local and state struggles, such as the current fight in Michigan over closing off the school employee pension system, she said. MEA needs members to step forward with individual stories about their lives as educators and community members with hopes and fears for the future, she said. White said she recently heard U.S. Sen. Elizabeth Warren (D-Mass.) speak at an event, and was struck by a line from her speech where she said this difficult time in our national politics is the one we’ve been called to. “I wish we hadn’t been called to it, but we have been, so it’s our responsibility and our obligation to step up,” White concluded.